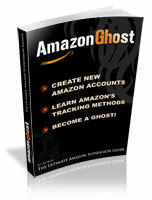 Does Amazon Ghost help you still sell on amazon without a passport or ssn? Re: Sell on Amazon without passport and ssn? You'll still need identify yourself when registering. Passport or driver's license and a bank/CC statement. What are your options if you have exhausted those two options (Passport + Driver's License)? You either use alternative documents or get a new stealth account(s).